Following the acknowledgement received from KORAN SINDO in 2013, “50 Most Excellence Public Listed Companies”. 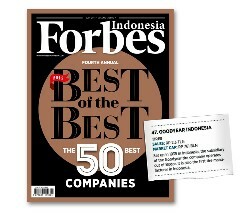 This year Goodyear Indonesia is also awarded as one of “50 Best Public Listed Companies 2014″ by FORBES Indonesia. Goodyear Indonesia – the almost 80 years old tire producer – is never wear off its grip to fill in markets need for safety tires. Leading for most any tire segments, commercial, consumer and OTR, Goodyear Indonesia has made benefit from its cutting edges technology research centres in Akron and Luxembourg by producing various range of market back-products type and rims.